Boule de Lille, or Mimolette cheese, has both French and Dutch origin. In some ways it's similar in taste to Edam cheese. However it is different in appareance - it has a carrot to burnt orange colored core, depending upon the degree to which the cheese is aged. Mimolette is from Lille, France, where it gets it's nickname from Boule de Lille. 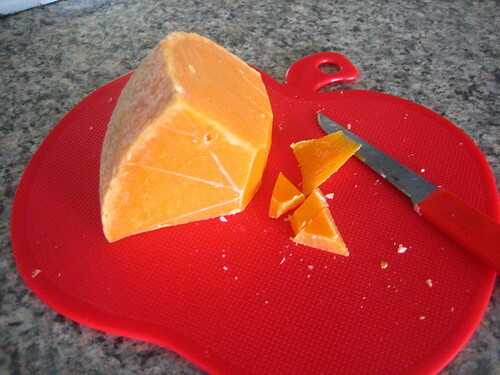 Mimolette cheese comes from a cow. Its defining taste is like a mild cheddar, and has a complex after taste. However as the cheese ages, it's flavor and profile completely changes. It is great with a loaf of bread with oil and vinegar for dipping, and some fruit, such as grapes or apples. Lille, France is located at the top near Belgium. Mimolette n'est pas doux, mais frais. C'est delicieux. Mais, mon prefere n'est pas mimolette. Mimolette est difficile. Il ressemble a du fromage cheddar. It wouldn't let me post, I don't know why.